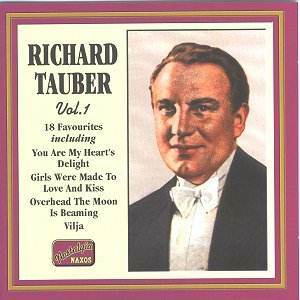 Richard TAUBER Favourites Vol. 1. Recorded 3rd October, 1929, in Berlin. Recorded 28th January, 1928, in Berlin. Recorded 26th February, 1927, Berlin. Recorded 17th March, 1931, in Berlin. Recorded 5th January, 1932, in Berlin. Recorded 26th January, 1932, in Berlin. With Orchestra Recorded 15th December, 1928, in Berlin. Recorded 5th October, 1928, in Berlin. Recorded 31st January, 1928, in Berlin. Recorded 25th October, 1928, in Berlin. Recorded 27th January, 1928, in Berlin. Recorded 4th October, 1929, in Berlin. Richard Tauber was a renown as a Mozart tenor, film star, pianist, conductor but most of all as a star of operetta. To most of his fans, not only in Germany and Austria but also in Britain and America, he was operetta personified - and especially he was famed for his association with the operettas of Franz Lehár. There were other excellent German tenors who were very successful in Lehár's operettas notably Joseph Schmitdt and Peter Anders, but it was Tauber who was famous internationally. In the 1920s and 1930s the sale of his records was phenomenal and there would be few collections which did not include at least one Tauber record (usually "You are my heart's delight"). To me this CD is nostalgia personified. As soon as I played the first number (the German version of the above-mentioned song) I was transported back in time to my father' collection of 78s in which Tauber recordings, as 10inch Odeon and Parlophone records with their brown labels, had pride of place. Tauber made a very large number of recordings which embraced most types of songs including opera, operetta, lieder and popular ballads - and all exhibiting a high degree of musicality even though his vocal range was not high. His recordings are nostalgic but not sentimental. The present CD concentrates on the mainstream of his popular repertoire, with the main concept rightly being the operettas of Lehár. Besides such favourites as the aforementioned "You are my heart's delight" and "Girls were made to love and kiss", the "Lied und Czardas" from Mariska are especially atmospheric. Another favourite is the "Tales from the Vienna Woods" arranged and conducted here by Korngold; Rossini's "La Danza" is also well done. Tracks 11 and 15 are relatively unusual "whispering records" where Tauber accompanies himself on the piano. The transfers throughout (by Davad Lennick) are excellent and this must be one of the best Tauber CDs available. The disc is attractively presented and has useful notes by Peter Dempsey. It is however already a well-filled market as there are already many Tauber transfers, some available so cheap that even Naxos prices are seriously undercut. However this disk is excellent in all respects and is recommended.